Do you have to be a professional photographer to use the space? No. UClick is open to ALL levels of photographers, including the general public. Whether you have an expensive DSLR or a point-and-shoot camera, you are welcome to use the studio. You DO need to be 18 years or older to rent a studio. Do you have a photographer on staff? No. We are photo studios for rent and do not have a photographer on staff. Our staff will assist you with your session by helping with backdrops and props. 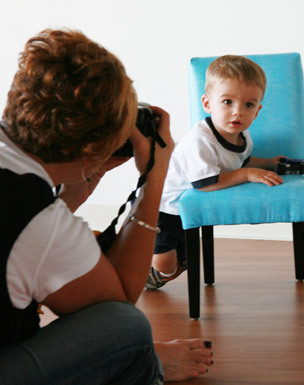 They will also assist with things such as getting children to look at the camera while the photographer/parent takes the pictures. Yes! Pets are allowed in the studios. We ask that they are leashed and controlled. Hazardous pets are not allowed (“hazardous” is left up to the discretion of the owner and employees of UClick Studios). Yes! Each studio has its own private changing room. Can I bring my own backdrops, props and/or lighting? Yes! You can use what’s available in the space and are welcome to bring your own as well. If it fits through the door and does not damage the studio, you are welcome to bring it in. Remember that your session needs to include prep and take-down time. Yes! We do not have a designated fenced-in area, however there are areas throughout the overall development for outdoor photo opportunities. There is a large fountain, a boardwalk running through a pond, our attractive brick building with a sidewalk and streetscape running parallel to it, several benches and eye-catching landscaping to incorporate into your photos. Parking is free and along the street.